Tigete holiday centre is located in Haaslava parish Alaküla village on the highway Uniküla-Vastse-Kuuste. 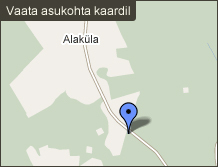 It is 23km from Tartu and also from Põlva. The village is beautiful with its hills, valleys, forest and also Lootvina’s lakes Pikkjärv and Tsõõrikjärv. Tigete holiday centre is located on two real estate- Tigete and Kõrre and all together it is 19 816m2. Tigete holiday centre offers you a chance to organize company events, winter or summer days, seminars and trainings, birthdays and anniversaries, weddings or just weekend get away from the city. We offer accommodation, camping and opportunity to park your caravan. We can organize orienteering games and offer a chance to play paintball in a real army trenches. For catering service we need pre-notice and it’s not included with the main package. Tigete holiday centre is in constant improvement and progress. Right now we are renting out a three-floored holiday home and a old traditional Estonian smoke sauna which is surrounded with two beautiful small bonds and also 3000m2 camping site. Tigete holiday home is about 150m2, houses up to 40 people and accommodates about 15 people. On the first floor there is a living room with LCD television, bathroom with WC and kitchen with all the necessary things. On the second floor there is a large hall with tabels and chairs and also a balcony where there is a table for ten and a grill where you can cook and barbecue. On the third floor are two bedrooms, WC and a balcony. We also have a sauna which is 60m2 and with two floors. On the first floor there is a sauna with the sitting room and WC and on the second floor there is a Estonian-styled little sauna bedroom which can accommodate up to 8 people. Thank you! Have nice experiences in our Tigete holiday centre!